Take a look to our recent connections and engagements and learn from them more about our operational method and perfection at all levels. As a part of its ambitious expansion plans, PCSOFT ERP Solutions Pvt. Ltd, the renowned ERP Solution developer based in Pune, has entered into a strategic business tie-up with the reputed MOOV Group based in Dubai, U.A.E. PCSOFT has been into ERP development and implementation business for past 27 years and has more than 1000+ installations of its flagship IEV ERP Solution, in India and abroad, serving a wide spectrum of industry verticals. 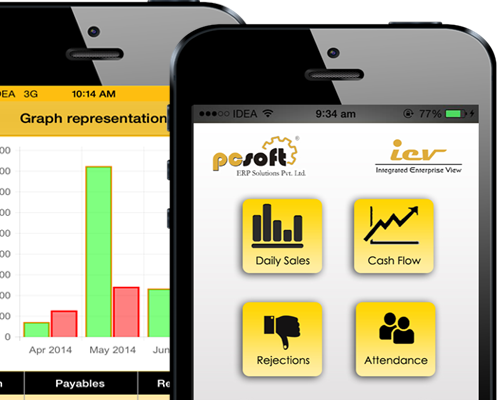 Hence IEV ERP Solution has turned out to be a mature, feature rich and user friendly product. PCSOFT, currently has a dynamic team of over 100+ qualified professionals, possessing unmatched proficiency in all facets of ERP software i.e. development, implementation and support. No wonder, PCSOFT offers a product that is truly “Global class with localized support” and Value for Money. (Visit PCSOFT at www.pcsoftindia.com) MOOV group on the other hand is a business house of repute catering to clients across the Middle East. It has diversified business interests in providing world class solutions spanning in Acoustic, Interior Fitouts, Oil Field, Telecom, Construction, HVAC, Home Theater and Software Development. It has its offices and affiliates in UAE, Tanzania, India and the USA. (Visit MOOV at www.moovgroup.com) Through this business tie-up PCSOFT will launch 3 versions of its IEV ERP Solution, namely IEV-CORE, IEV-OPTIMA and IEV-ENTERPRISE for G.C.C. Countries beginning 2016. IEV-Core is a compact, economical and pre-configured version of IEV ERP Solution. IEV-Lite being a pre-configured product is easy to use and quick to deploy at customers’ site. IEV-Lite has all the basic yet major functionalities that are generally expected by micro / small businesses, startup ventures and trading companies. IEV-Optima is a scaled down, yet robust version of IEV-Enterprise ERP Solution having optimum number of features. IEV-Optima being a pre-configured product, is easy to use and quick to deploy at customers’ site. IEV-Optima has encapsulated major functionalities that are generally expected by Mid- Sized Manufacturing and Trading companies. IEV-Enterprise is a comprehensive, versatile and feature rich ERP Solution. IEV-Enterprise can be configured and parameterized depending on the customer’s business processes. IEV-Enterprise has encapsulated major functionalities that are generally expected by Large Sized Manufacturing and Trading companies. A comprehensive payroll module is also offered as an extension along with all the 3 versions of IEV.